When you have multiple inflatables including moonwalks and water slides, then you need an inflatable repair kit that can take on multiple issues. Our premium repair kit contains more than enough materials to keep your bounce houses in tip top shape. 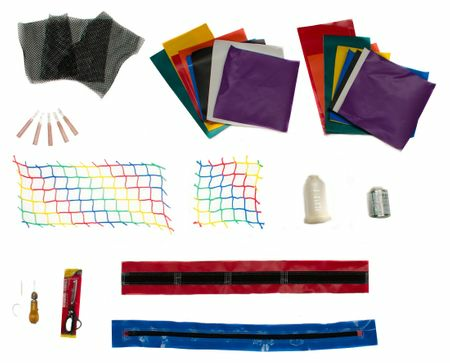 This repair kit for inflatables contains everything from the standard repair kit and much more. The Premium Repair Kit has everything you need for on the spot repairs. Not only that, but the storage bag doubles as a sandbag. Inside the storage bag/sandbag, you'll find: three mesh patches, colored vinyl patches, five seam rippers, two square feet of rainbow netting, a pound of thread, 16oz ultra vinyl repair glue, scissors, sewing awl, glue-on Velcro patch, and a DIY deflation zipper. If you have an inflatable business, then this is a must-have item. Don't wait until the punctures and tears happen. Get the kit today, so you're prepared no matter when it happens. You can even purchase additional individual items from the order page. We understand that some items may run out faster than others, so feel free to grab a few extras.